The Pedricks like the Devereuxs have a prominent place in this family tree as each of the first immigrant couples, John and Ann Devereux and John and Miriam Pedrick, had three children who were our direct ancestors. Each also had two grandchildren who were our direct ancestors. The chart below traces our ancestry to its Pedrick roots. John Pedrick Jr. is part of the second generation of Marblehead Pedricks. He and his wife, Mary Browne Pedrick, are on the right. The Pedricks were mariners and fishermen in the generations leading up to the Revolution. John Pedrick died after his three children were born. His widow, Miriam Hendley Pedrick, married William Giffords, with whom she had two children, and then thirdly, Peter Briggs. Miriam Pedrick married John Homan and died a couple of years later in 1717 with no apparent children. There is a marriage record for John Homan to Jane Giffords in 1720. Jane was the sister of William Giffords, the second husband of Miriam Pedrick. Although not substantiated, this appears to be widower our John Homan. Richard Pedrick and his wife, Jean Merritt, are our direct ancestors and have their own family group page. 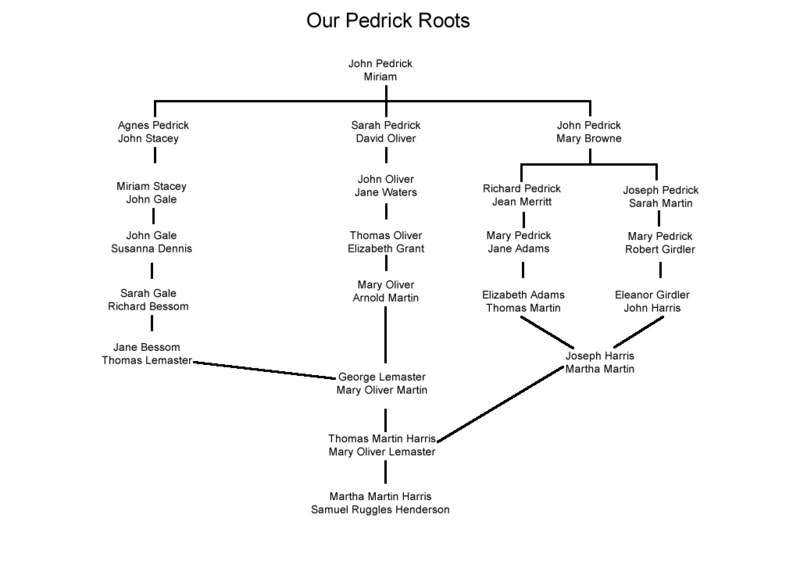 Joseph Pedrick and his wife Sarah Martin, are also our direct ancestors and have their own family group page. The Richard and Joseph Pedricks lived in the affluent days leading up to the Revolutionary War, and some of their children are related to Marblehead legends.. Be sure to visit the Documents sections for articles about these legends and Marblehead life during the Revolution. The genealogical records and vital statistics are our best proof of relationship for our direct ancestors in this family.